I first encountered John Giorno’s poetry in the early 1980s at the Final Academy, a celebration of William S. Burroughs life and work that happened in London. The next time was at a Tibetan Buddhist teaching in the space that was formerly Burroughs’ bunker on the Bowery in New York in the 1990s. John’s poetry moves freely in those spaces — the post-Beat world, avant New York, Tibetan Buddhism — and it’s changed my life and that of many others. 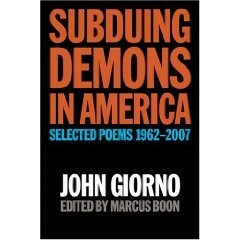 Subduing Demons is the first career spanning collection of John’s work. I edited it, with full access to John’s work, and it contains many of John’s greatest poems, from the 1960s Pop/appropriation pieces such as “Constitution of the United States” to the psychedelic Buddhist pieces of the 1970s, to the hard hitting AIDS era slogan poems of the 1980s to outrageous recent pieces like “Thanx 4 Nothing”.